Standing on 400 acres of property and surrounded by 27 Warmblood horses, a result of their own elite breeding program, Ken and Teresa Mellish reflect on how exactly they came to be where they are today. Together, and with the help of their two children, Ken and Teresa persevered through challenges and overcame obstacles to establish their world class horse breeding program. During that time, they also maintained a number of volunteer initiatives, both locally and globally, and have earned the joint title of Volunteers of the Year at Dalhousie University Faculty of Agriculture’s 2017 Blue and Gold Awards. The Blue and Gold Awards honour alumni who have distinguished themselves through outstanding service to Dal AC, their communities, Atlantic Canada and beyond. 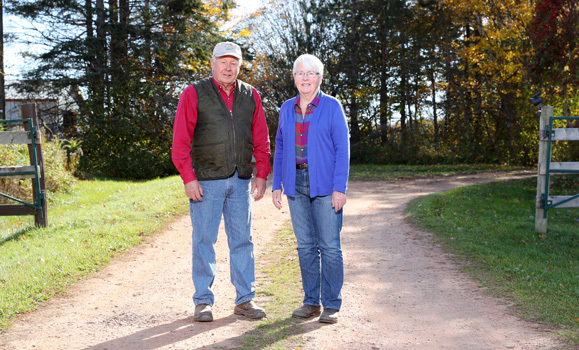 Ken (Class of ‘65) and Teresa (Class of ‘66) Mellish are the proud owners of New Perth Farms. Located in the beautiful rolling countryside of Prince Edward Island, New Perth Farms is an established breeder of dressage horses. Dressage, often described as ballet for horses, is a highly skilled form of horseback riding where horse and rider are expected to perform a series of predetermined, and often challenging, movements. Competitions are held from amateur through to the Olympic level. Ken and Teresa pride themselves on producing horses who are eligible to compete at high level dressage competitions. While their focus is predominantly on producing dressage horses, they also produce top quality jumping horses. Ironically enough, Ken was raised on a mixed farm across the road from New Perth Farms and Teresa on a dairy farm in New Brunswick. So when they purchased the current property in 1980, naturally, they chose to continue dairy farming. The property had no buildings so they constructed the proper structures to turn it into a dairy farm. 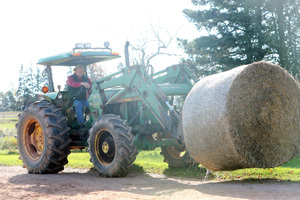 From 1980 to 2002, Ken and Teresa milked 40 purebred Holstein cows and produced grain and forage as feed for livestock. 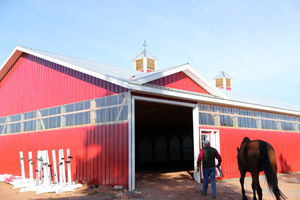 Although the farm still continues to produce forages, in 2002, they sold their quota and converted the dairy barns to horse barns. They imported high quality breeding horses from the Netherlands which became the foundation of their breeding stock. 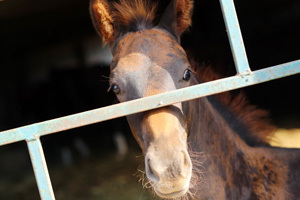 Today, the farm is home to 27 New Perth owned Warmblood horses. Their successful breeding program saw, and continues to see, a number of New Perth horses earning national and international championships all across North America. While Both Ken and Teresa are active on the farm their daughter also plays a role in training the horses. Dr. Martha Mellish (Class of ‘03) works full time as an equine vet at the University of Prince Edward Island’s Atlantic Veterinary College. It’s Martha who Ken and Teresa credit for peaking their interest in Warmblood horses. The farm is also home to “Perth Pumpkin Patch” which is run by Ken and Teresa’s son, Angus (Class of ‘98), and his wife, Shauna (Class of ‘98). Their two daughters, aged seven and 10, also help out. New Perth Farms is currently constructing a new indoor riding ring, the first new building that has been constructed since the original dairy barns were built. The new indoor facility will allow the farm to continue to train horses year round, despite any challenging weather. It will also allow Martha to be able to work with the horses in the evenings after dark. Although the farm keeps Ken and Teresa busy, they are both active volunteers with a number of local and global initiatives. Most notably, Teresa is a founding member of Farmers Helping Farmers (FHF), a non-profit organization that helps build sustainable agriculture communities in Africa. From 1971-1973, Ken and Teresa were volunteers with CUSO, a development organization that works to reduce poverty and inequality through the efforts of volunteers, collaborative partnerships and compassionate donors. Through CUSO, they spent time in Malaysia, Teresa teaching courses in agriculture and Ken conducting research, and developed an interest in travelling. 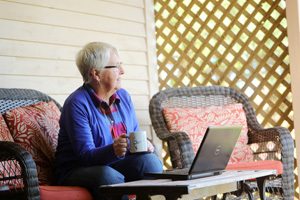 After travelling extensively through developing countries, the pair returned home to work for the provincial department of agriculture in agricultural extension work and eventually to begin their own farm in 1980. After they started farming, they were involved in a number of community activities. Ken chaired the PEI Milk Marketing Board and both have supported and played an active role in horse shows hosted by Dressage PEI. In 1980, Teresa was involved with an international farm consultation on PEI. It was during that conference that a hurricane swept through the island of Dominica, destroying entire banana crops of visiting farmers at the conference. A number of Islanders raised money to help the farmers replant their banana crop. As a result of that fundraising initiative, a number of Islanders expressed interest in travelling to developing countries to get a firsthand feel for farming and its challenges. Teresa applied and received funding from the Canadian International Development Agency (CIDA) for $250,000 to go towards farming projects in Kenya and Tanzania. This was the first project under FHF. Since that inaugural trip, numerous Islanders have travelled to Kenya and have raised money to help create sustainable agriculture practices. The organization works with one group for five years and then, through a joint exit strategy, moves on to another. Today, FHF remains dedicated to their grassroots fundraising. The organization also remains partnered with the University of Prince Edward Island, and has just launched a new partnership with Universities Canada. Along with helping to develop farming practices in Kenya, FHF has expanded to provide tools to develop rural entrepreneurs, lunch programs to ensure Kenyan school children receive lunch at school, and resources for farm women. As volunteer coordinator (Teresa) and chairman of the project committee (Ken), Ken and Teresa continue to travel to Kenya once per year to volunteer and pay visits to the many close friends they have developed in Kenya. It is Ken and Teresa’s passion for farming and dedication to helping those in need that led to the have development of FHF, which has gained extraordinary provincial, national, and international acclaim. Over the past 37 years FHF has raised over ten million dollars, including support from CIDA, to help farm families. With their extensive volunteer resumes, it would certainly be difficult to find anyone more deserving of the Blue and Gold Volunteers of the Year award than Ken and Teresa Mellish.